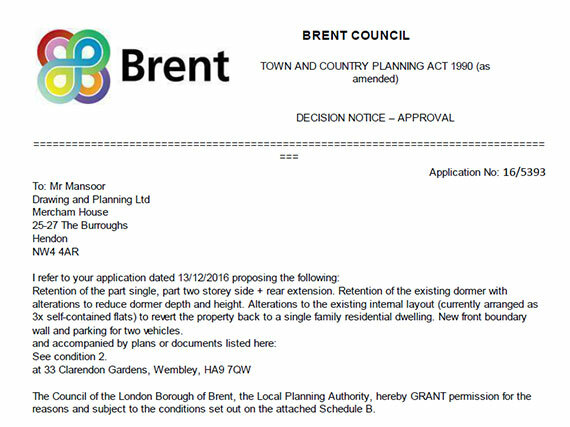 Drawing and Planning have successfully secured a Planning Permission for retention of the part single, part two storey side + rear extension. Retention of the existing dormer with alterations to reduce dormer depth and height. Alterations to the existing internal layout (currently arranged as 3x self-contained flats) to revert the property back to a single family residential dwelling. New front boundary wall and parking for two vehicles. PROJECT Retention of the part single, part two storey side + rear extension. Retention of the existing dormer with alterations to reduce dormer depth and height. Alterations to the existing internal layout (currently arranged as 3x self-contained flats) to revert the property back to a single family residential dwelling. New front boundary wall and parking for two vehicles.